The top floor of Beningbrough Hall is devoted to a vibrant compendium of galleries which combine the National Portrait Gallery’s 18th century collections with temporary displays and interactive touch screen computers which aim to bring the outstanding portraits to life. Following a refurbishment in 2006, the galleries in this Baroque mansion provide an appropriate historical setting to display a wide programme of collaborations. 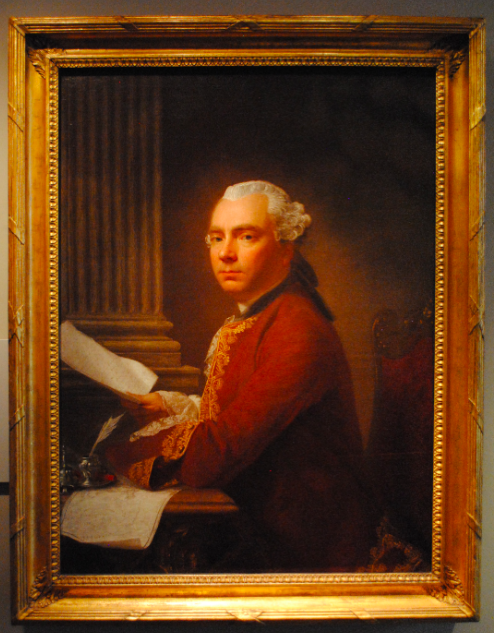 The above oil on canvas dates to 1755 and depicts the classical scholar Robert Wood. Wood led ground breaking archaeological expeditions to Greece and the Middle East during the early 1750’s and he wrote two important works: the Ruins of Palmyra (1753) and the Ruins of Balbec (1757). The portrait is the work of the Scottish portrait painter Allan Ramsay and was painted in Rome where Wood was working as a tutor to the Duke of Bridgewater.